Soaring ceilings, built-in furniture, and minimal color make this pared-down German home feel huge. 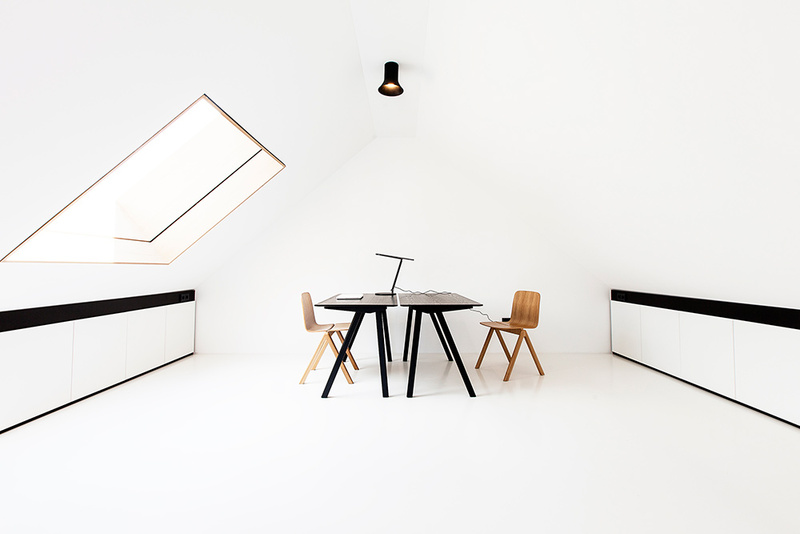 In the top floor study area, a pair of Copenhague Desks by Ronan & Erwan Bouroullec forHAY are stationed below a Sax hanging light by Vertigo Bird. A large bed hides behind the couch in this 522-square-foot guest apartment in Prague. The lights affixed to the canopy bed frame are Nordlux Cyclone reading lamps. In this renovated 19th-century house in Cambridge, Massachusetts, white paint was a money-saving strategy, as it requires fewer coats than color. In Okazaki, Japan, architect Katsutoshi Sasaki loosened up a potentially confining house on a narrow lot with an abundance of natural light. High windows in the main living area bath the space in natural illumination, while the staggered series of smaller windows in the children’s rooms function like portholes. The bedroom of this Montreal renovation is enclosed with a glass wall. A blackout curtain can be drawn closed for privacy. An Ikea cabinet and custom white lacquered shelves provide plenty of closet space.